President Obama’s admission of drone strikes in Pakistan was telling. They may, however, not be very effective. Even in Pakistan, no front pages were held when U.S. President Barack Obama openly acknowledged last week that the United States has been conducting air strikes inside Pakistani territory. After all, it has been common knowledge for several years now that the U.S., with a nod and a wink from Islamabad, has been using Predator and Reaper drones to bomb militants in the Federally Administered Tribal Areas (FATA) along the border with Afghanistan. The fact that Obama feels comfortable discussing the drone strikes in an election year demonstrates that, politically, they are a non-issue for American voters. Nevermind the questions of state sovereignty, legality, or the unintended casualties that the strikes tend to inflict. The message U.S. citizens take home when they hear about drone strikes in the FATA is that their government overrides such concerns in the pursuit of America’s enemies – and it’s a message they are mostly comfortable with. The question that not enough people are asking, however, is whether the drone strikes actually work. Drone attacks are a tactic, not a strategy. Certainly, they are a good means of killing some people: the New America Foundation estimates that between 1,717 and 2,680 individuals were killed in 283 drone strikes in northwest Pakistan between 2004 and 2011. The danger, though, is that as the U.S. seriously considers wrapping up combat operations in Afghanistan as early as next year, the tactic of drone strikes is becoming the strategy. The strategy so far has been to nullify the threat of terrorists in Afghanistan and Pakistan, with UAV strikes being just one instrument in the counterterrorism armoury. But as drone strikes assume ever greater importance and, from 2014, effectively become the entire mission, can they deliver that critical strategic goal of keeping the militants at bay? The second study, by David Jaeger and Zahra Siddique, finds that “while the drone strikes [in the FATA] may do little to damage the operational capabilities of the Taliban (there are always other Taliban recruits to take the place of a militant leader killed in a drone strike)…the show of strength through these strikes may reduce subsequent terrorist attacks by the Taliban in Pakistan.” In other words, drone strikes may scare Taliban fighters into lying low for a while, even if they don’t inflict much actual damage. That’s deeply underwhelming news, if your business is to nullify the threat of Central Asian militancy. Besides inflicting negligible amounts of damage, the drone approach is a self-defeating one in that air strikes in the FATA breed resentment and so perpetuate they very problem they were supposed to address. It’s understandable if Obama should deem this acceptable: he may be feeding an open-ended cycle of violence in which he creates as many enemies as he is able to kill, but at least the unwinnable war is happening in a remote place, a long way from America. But this can’t go on forever. Circumstances around the FATA will change considerably over the next couple of years: NATO will ship out; the Taliban will probably make some kind of political comeback in Afghanistan; and a politician like Imran Khan, who opposes drone strikes, could be running the Pakistani government. Dropping bombs in the FATA may have its short-term psychological value: it demonstrates that no enemy is beyond America’s reach and it carries the war to the Taliban, in however tokenistic a fashion, in territories that would otherwise be beyond the reach of U.S. forces. Nonetheless, Washington will soon have to disengage the autopilot and find a more constructive solution to the growing problem of militancy in the region. China to Lead World in Drone ProductionAfghanistan-Pakistan Border: Back to Politics as Usual?Lasers: Asia's Coming "Sci-Fi" Arms RaceThe Ultimate Missile Defense: Drones? 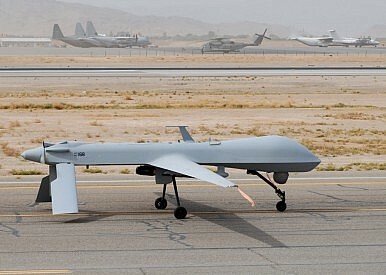 Will America's Addiction to Drone Strikes Backfire?